This award is a small bronze statue of a sea turtle. It is special because it is the only one in the USA and it is traveling all over the world visiting people who are working to make a good and lasting change in the community or the planet. 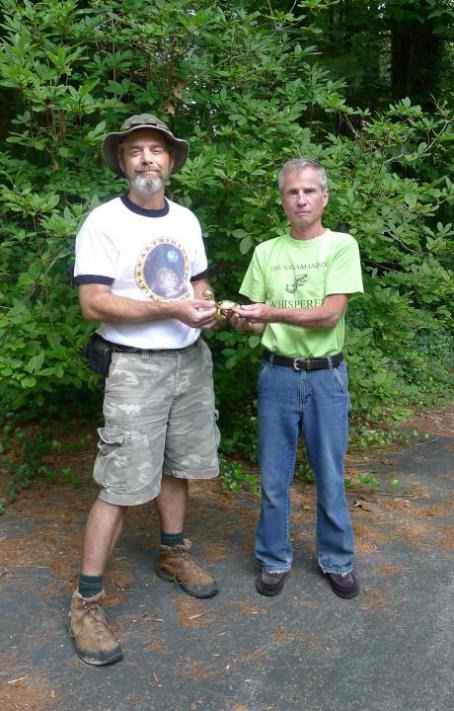 The turtle called “Turtle Grupo Tortugero” was presented to Steve by the previous recipient of the turtle Alan Cameron. Alan is also known as “The Salamander Whisperer” because of his ability to find endangered Green Salamanders where no one else can find them. Alan has been volunteering with the NC Wildlife Resources Commission for many years and has helped them find thousands of Green Salamander sites all over WNC. Alan presents Steve with the Turtle of Change. 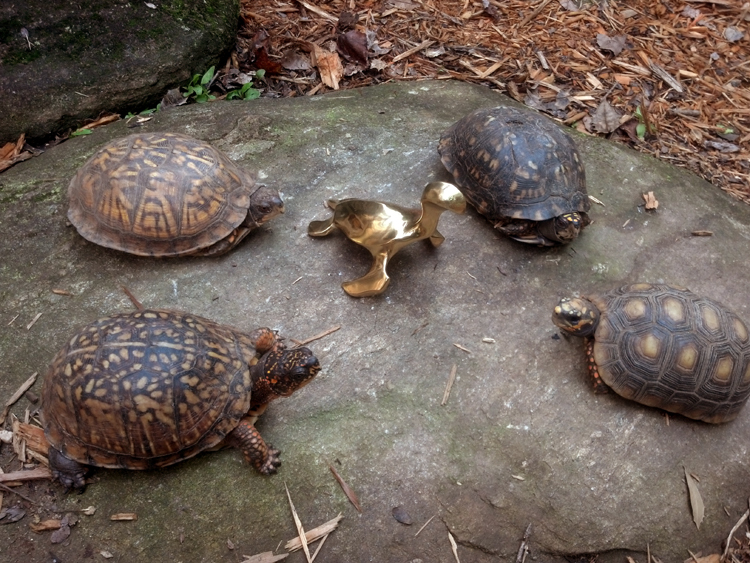 Three of the Earthshine turtles are Eastern Box Turtles and one is a Redfoot Tortoise. All of our turtles have either lost their homes due to development, are ex-pets or were badly injured due to unfortunate meetings with vehicles, lawn mowers or dogs. Tripod–on the bottom left–is our mascot. She lost her right rear leg after she was hit by a car in 2007. The turtle to Tripod’s left is Lucky. She was also hit by a car and suffered severe trauma to her left rear leg and shell but she has recovered nicely. The turtle to Lucky’s left is Crash. She was hit by a car and had such severe injuries that I did not think she would survive. After a visit to our veterinarian Dr. Coleman, I patched her up with epoxy, gave her some antibiotic injections and fed her loads of box turtle favorites and she has made a full recovery! The final turtle is Charlie. I found her at a reptile show and felt sorry for her so I gave her a great home at our nature center. Sadly, all of the turtles at Earthshine Lodge and Nature Center cannot be released due to their circumstances. They are however wonderful education animals that help teach people about the wonder and beauty of nature and why animals like the Eastern box turtle need understanding and protection. After visiting with the turtles at Earthshine Lodge the Turtle of Change traveled with me to a local Veterinary Clinic–Sweeten Creek Animal and Bird Hospital–where I met up with Dr. Lee Bolt and Dr. Ron Davis to assist with the radio transmitter implantation surgery on a Timber Rattlesnake. 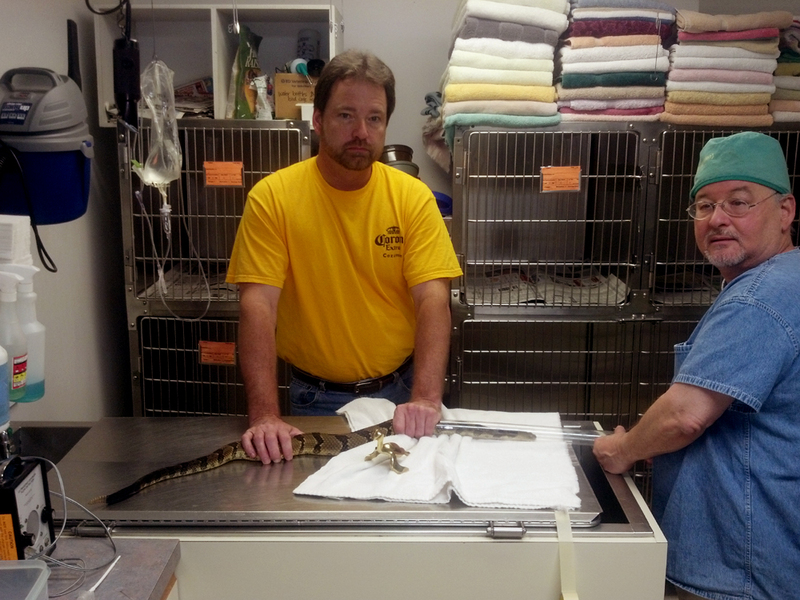 Take a look at the photo of the turtle on the operating table with the rattlesnake, Dr. Davis (in yellow) and Dr. Bolt. The surgery went flawlessly and the snake has recovered and has been released back into the wild. Dr. Davis will track the snakes movements over the next few years in order to learn as much as possible about the life of the Timber Rattlesnake. The knowledge he gains will be imparted to his students who will become future wildlife biologists, conservationists and naturalists. The next stop for the turtle was at a remote rock outcrop known as the “Secret Place” on the side of a mountain near Brevard, NC. USA. This rock shelter was used by the Native Americans as evidenced by the petroglyphs on top of the rock. 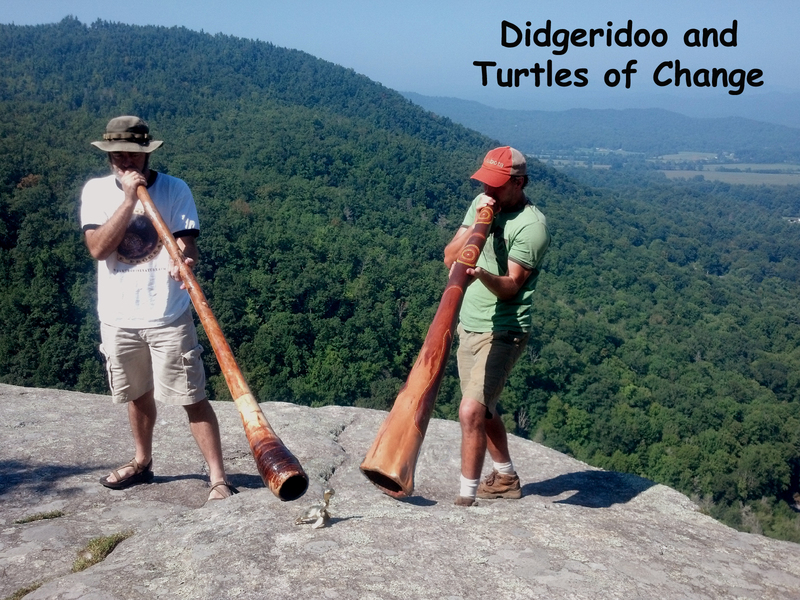 I teamed up with my friend (and didgeridoo virtuoso) John Vorus to play didgeridoo (yidaki) over the turtle in this amazing power place. We first played our yidaki to the turtle on top of the rock then moved down under to the rock shelter and recorded a video. Take a look at the photo on top of the rock and video of our time at “The Secret Place.” View the short video of our concert for the turtle of change here. The final stop for the turtle (so far) was when it followed me to the office of Dr. Coleman DVM. Dr. Coleman is a wonderful veterinarian and lover of all wildlife and my wildlife vet. 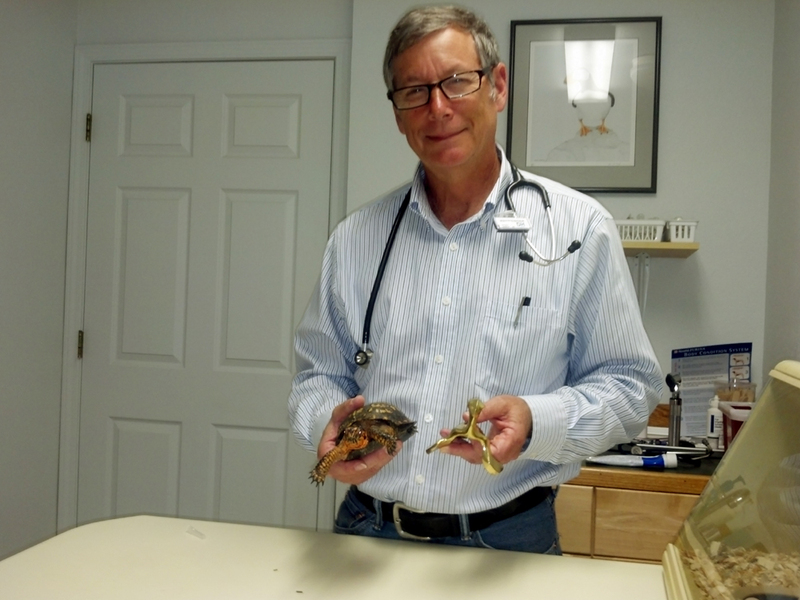 I snapped the photograph of Dr. Coleman and the brass turtle while he was treating a wild box turtle. Thank you Dr. Coleman for all that you to for wildlife and for Earthshine Nature Programs! THANK YOU Alan Cameron for presenting me with this great honor. View the Turtles of Change website to learn more.